NYCE-Nepal, established in 2004, is a non-profit organization registered with the social welfare Council of Nepal government. The organization aims to empower local communities by organizing community development, education and conservation projects. Since its establishment, it has been running volunteer program in Nepal for volunteer promotion and cultural exchanges. NVCYE Program offers year-round volunteer program in the area of teaching, orphanage, conservation and health. Our focus has been primarily on community development and conservation projects. ICYE Program offers a unique opportunity for those people who are keen to enjoy the amazing beauty of the Himalayas, the nature and the rich cultural diversity. A combination of travel, adventure, exploration and contribution will surely make your Nepal stay ever-lasting memory of your life. In orphanages, most of the activities focus on educational training for children. Therefore, volunteer will be teaching Basic English language to orphaned children. Volunteers also help them in food distributions, sanitation of children, helping to wear clothes. Volunteers can participate in health education, games, drawing, painting and other creative activities for Children’s development. In teaching program, volunteers will work as a teacher for small school children (6-13 years) in elementary schools. As a teacher you can also organize other activities like games, dramas and painting. You don’t need previous teaching experience to join this project. However, you should be fluent in the English language. Native English speaker are preferred. The project is located in Rampur, Chitwan and organized in village-based nursery. Duties in nursery include seed collection, pruning, weeding, trimming, seed sowing, mulching, care of small seedlings, watering, etc. Some other nursery related activities like fencing; bed preparation etc. can also be carried out simultaneously. In health program, volunteers will be placed in our local health centre or health post. Volunteers will be helping doctors, nurses, and other medical staff in treatment of patients with minor injuries. Also, volunteers can participate in other activities like record keeping, sanitation, medicine distribution and other on- going programs in the hospital. Volunteers interested to work in the health project should have some level of work experience in health/medical sector. Only health professionals, medical students, nurses, and volunteers with similar experience are allowed to join the medical project. You must show medical certification or an ID card which states that you are a medical student. Volunteer need to donate $100 a month directly to the health organization they are volunteering with. 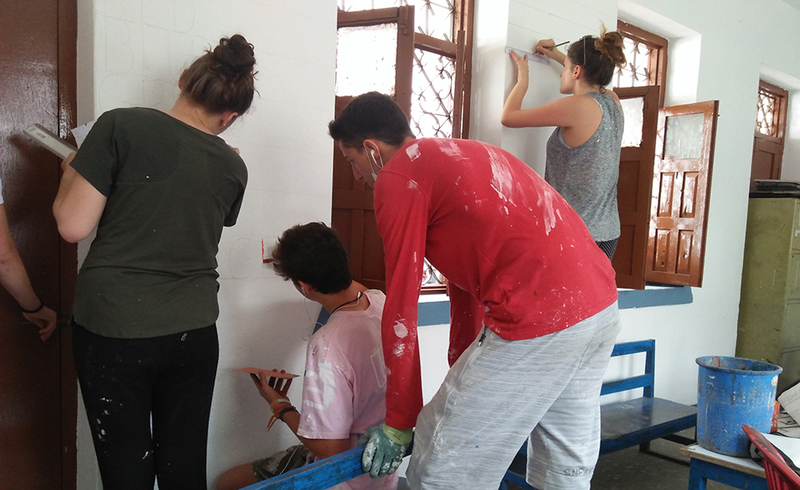 NVCYE Program offers volunteering placements for anyone who wants to volunteer while living with a host family and engage in useful humanitarian work. For most placements, no experience or specialized skills are required. All you need is an open mind and a commitment to do something positive for local communities and for the people of Nepal. You don’t even need to speak Nepali or perfect English. You will work alongside local people in a place you want to volunteer. You will stay with a local family during your entire volunteering period. You will be warmly welcomed by friendly Nepalese people who will allow you the opportunity to immerse yourself in Nepalese culture in a way few tourists have ever been able to do. Whatever type of work you do, you will take home with you fond memories and satisfying moments, whilst also making local friends and gaining new perspectives. NVCYE will manage your host family, in collaboration with local partners. Most of our host families have previous experience hosting international volunteers. The living conditions of the placement depend on the area. One should not expect luxurious accommodations in Nepal. You will be placed within a family setting with your own room. Most placements have electricity. (If electricity is an asset it can be arranged). Some members of host families may speak English. Room will be clean and well ventilated. Most of our past volunteers have stayed with their host family as a son/daughter or brother/ sister. We expect that you also treat them likewise. Please keep in mind that placements in host families are not meant to be like any hotel stay. It is therefore important to follow the family rules during all times. This is also a noble gesture that shows you respect your host family and appreciate their hospitality. Please do not use alcohol or any kind of drugs while staying with your host family. If your host family asks you to take alcohol, please take it with care, as most of the locally made alcohols are very strong. The Nepalese society is very conservative (or not influenced by western culture), please dress modestly and avoid any kind of dating or romantic activities with any members of the host family. Please do not use facilities of the host family (TV, radio, VCR, bike etc) without their permission. Please clean all your clothes and dishes yourself. Always keep your doors closed when you go out. Note-Host families offer Nepali food (three times a day including breakfast) for volunteers. Nepali food consists of rice, vegetable curry, pickle, meat (occasionally), daal (lentil soup) etc. Host families do not serve any exotic cuisine.